So lets start with Strava | theraceforthecafe.com . This is the first of a series of posts on the topic of Strava – I thought it was a good place to start as a lot of cyclists use it and a significant chunk of my thesis was devoted to it. Just to be clear, I am NOT anti Strava, I am an avid user and have been since 2012, I upload my rides daily and as a training aid (which is what I mainly use it for) I think it is an excellent tool. MyStrava What I am aware of however, and what my research has revealed is that Strava usage is having an effect on the social world of racing cyclists. As a sociologist it is these effects that I am particularly interested in and what I will try to explain them here and in upcoming blogs. The ever growing popularity of Strava with cyclists at all levels of participation has continued to increase during the course of my research, and it is now available in thirteen languages and according to their own website, Strava receives over three million uploads per week globally (Strava, 2016). The billions of anonymised data points generated through Strava usage have the potential to provide a unique perspective on cycling behaviour, particularly in urban areas. Examination of this data in future research will no doubt provide valuable insights to advocacy groups, urban planners, local government and anyone who has an interest in improving cycling infrastructure and promoting cycling as an activity. ‘The internet: (Strava) worst thing to happen to cycling in years’. This article was based on some research presented to the 2013 Royal Geographical Society conference which revealed that Strava changes how and where people ride and how they engage with their surroundings. The app (Strava) is either the best thing to happen to training in years, or it transforms users into inconsiderate egotists more concerned about topping online leader boards than road safety. The co-founder of Strava, Michael Horvath was quoted by Kelion on the BBC News website as stating that 'the core of Strava is the storytelling and social aspect, which connects athletes'. Horvath elaborated further on the social aspect of Strava by confirming its potential to change behaviour. What we wanted to do is connect you with other people so you don’t feel so alone, even when you’re training alone. If you can see yourself relative to other folks and you know your workout is going to be exposed to them after you’re done, it’s going to motivate you. 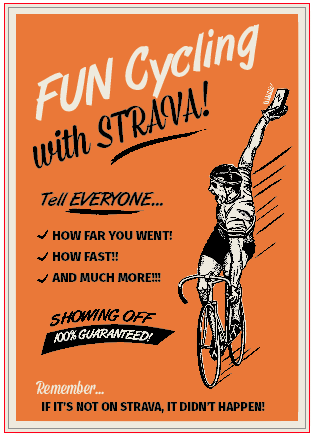 As McMahon (2015) recently commented in Cycling Weekly, Strava and the implications of its use has the potential to shape cycling participation in a wide range of contexts. Whether you actively resist it, are a regular user or upload even the two-mile commute to work most cyclists would agree that since its 2009 release Strava has become one of the most significant technological and social innovations cycling has seen. As part of my research I interviewed 149 racing cyclists and asked them about the effect of Strava and I will be including some of their anonymised comments in later blogs. The comment below captures well the influence of Strava participation.